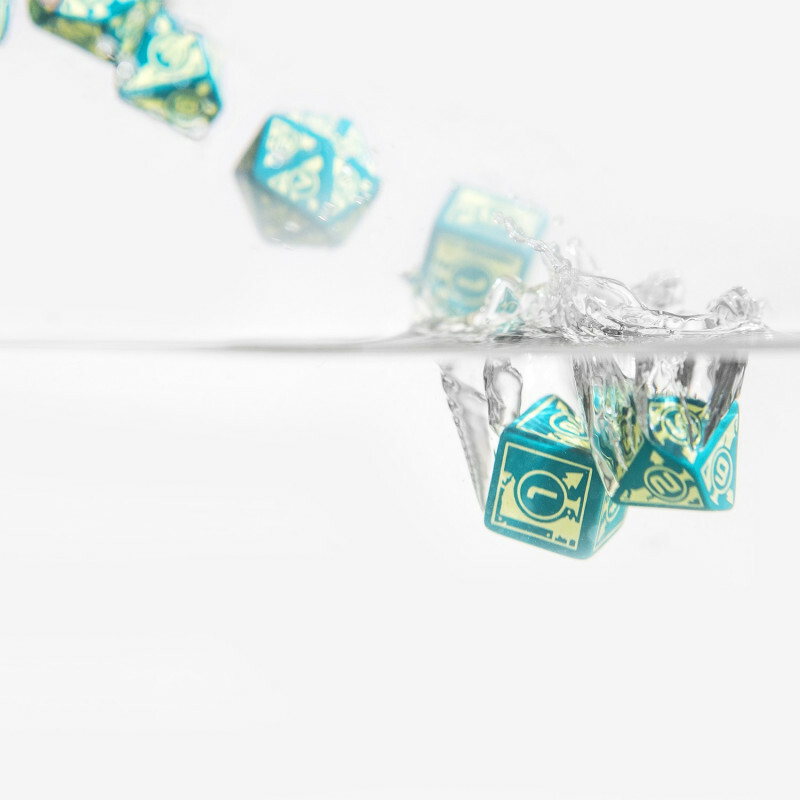 Q WORKSHOP proudly presents waterproof dice for the adventures in dark and mostly moistly universe of Polaris RPG, one of the true diamond from Black Book Editions. 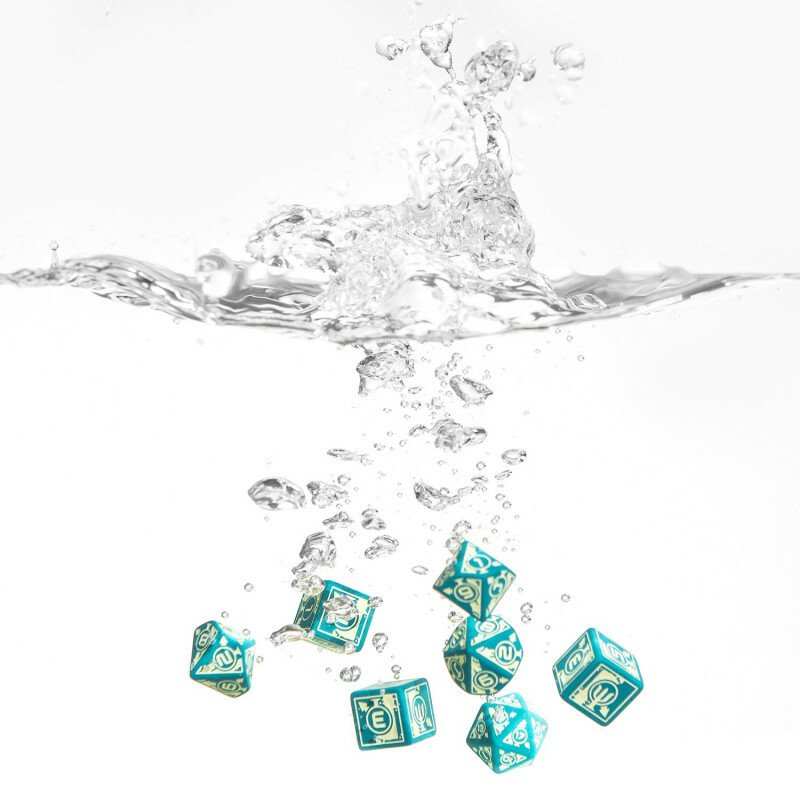 Q WORKSHOP proudly presents waterproof dice for the adventures in dark and mostly moistly universe of Polaris RPG, one of the true diamond from Black Book Editions. This game was a great success on Kickstarter and it's just the start of the road to success. In the world of Polaris, the devastated future Earth above sea level has become uninhabitable for the humankind. Life was born in the sea and now people are coming back there to die. Only brave heroes can survive in depths of the oceans, fight with the mysterious Burrowers, uncover ancient secrets and live long enough to find the welcome haven. 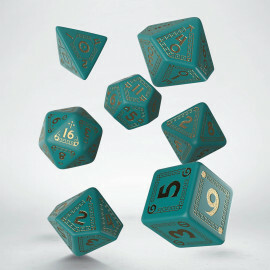 Our turquoise dice set is designed to help all heroes survive and enjoy life with all its dangers. Made from best material, durable as the submarine double hull, elaborated as best deep-water submersible and majestic like a yacht under full sail. Complex engraving, with the symbol of Cult of Trident on highest faces, is filled with light yellow paint so permanent that even tsunami couldn't wash them. 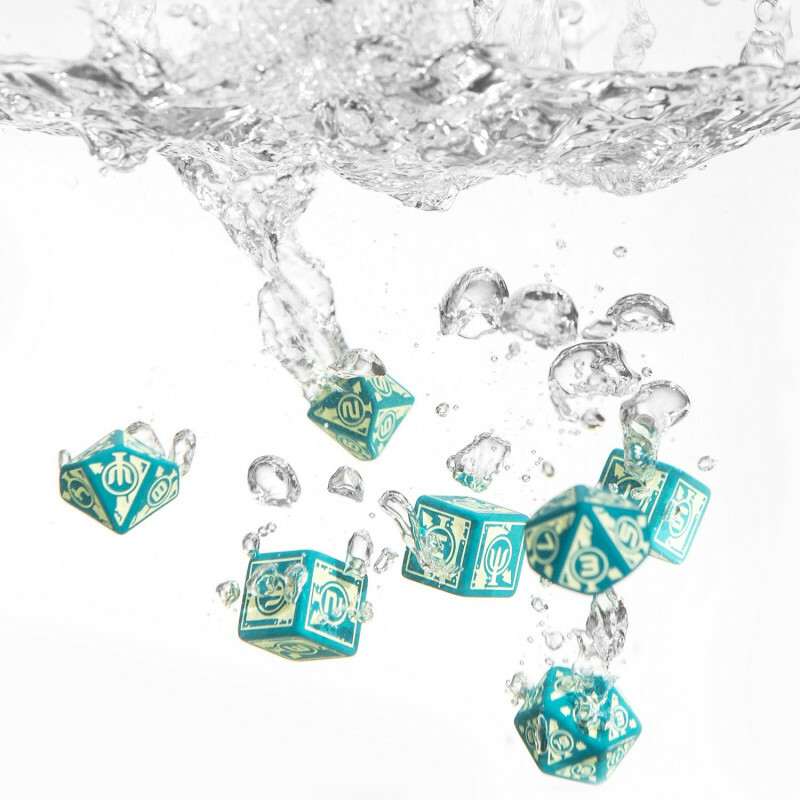 We gave our dice the look of real divers watch because this color scheme support the feeling of the thousands of miles of underwater adventure and siren's song of the deep ocean. This is not a typical seven pieces set of RPG dice. This is our Hybrid Set. 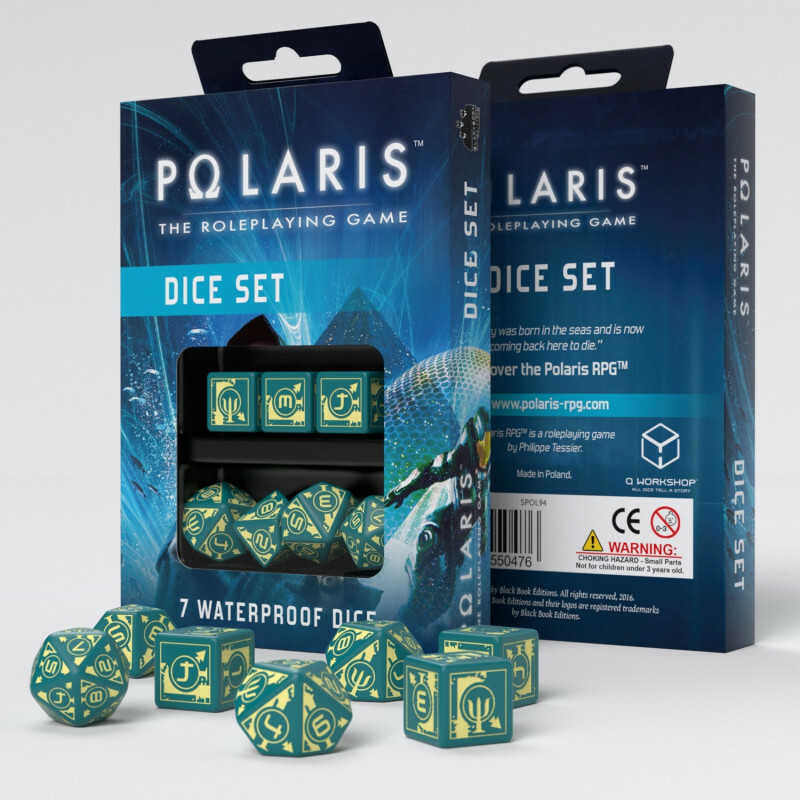 Hybrids in Polaris are people naturally or genetically altered to breath underwater, be naturally armored, swim faster, be more resilient and dangerous as for example sharks or other sea monsters. 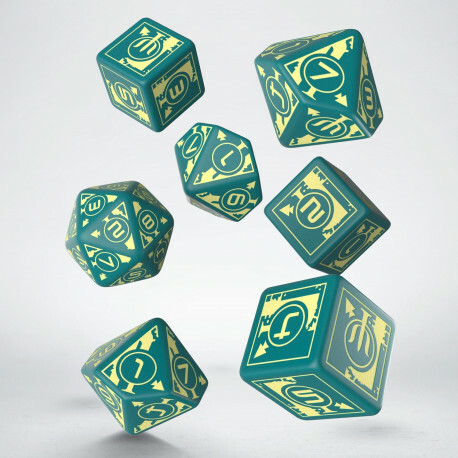 Like Hybrids in the world of the game, this set is better matched to the world and game rules, so you will find here one beautiful d20, three d10 and three d6. We have tested, that this is the best combination. This set gives you the right pool of dice that you will use in the game, as pro gamer not as any poor washout. D20 is for most tests, and others are mostly the time for a very important thing: damages in combat! This set rolls high! We can't write more about its capacity, because advertising the violence is not our plan. Try them, swim with them and be careful because deep underwater there are treasures and monsters, as in life, but underwater, there is less sunlight, and no one can hear your scream.